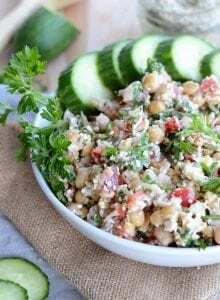 I make this grain-free mashed chickpea tabouleh salad so often I figured it was about time I share it with you! Ready in about 10 minutes, this salad makes the perfect quick and easy meal. Simply mash up the chickpeas, chop a few veggies, mix in some tahini and lemon and you’re all set for a flavourful, healthy, plant-based meal. Tabouleh is a Middle Eastern vegetarian dish traditionally made from fresh vegetables, bulgur or couscous, olive oil, parsley and herbs such as parsley and mint. This grain-free version uses mashed chickpeas in place of bulgur or couscous. Mashing the chickpeas or pulsing them in a food processor creates somewhat of a grain-like texture and consistency that complements the rest of the flavours and adds some healthy fibre and protein to the dish. I love making tabouleh with couscous too but I really enjoy this twist on it too. 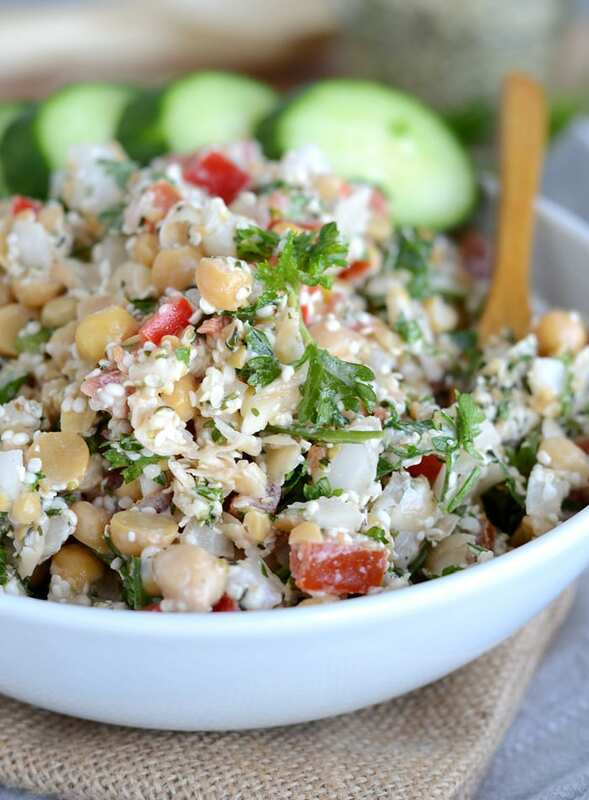 Traditionally, tabouleh salad recipes use quite a bit of olive oil. I leave out the oil completely and use some tahini too add creaminess. Plenty of garlic, fresh lemon juice, parsley and sea salt add the rest of the flavour. 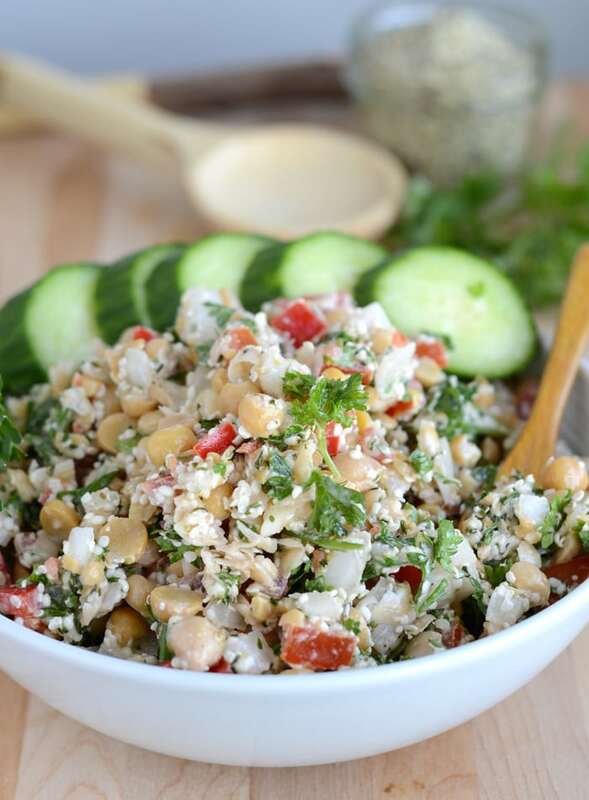 Tabouleh recipes usually call for fresh mint too but I don’t use any in this recipe. Feel free to add some in if you desire! I’m sure it would be a delicious addition. Adding flavour, texture and nutrition, hemp seeds are another key ingredient in this salad. Hemp seeds, or sometimes called hemp hearts are one of my favourite superfoods. Hemp seeds are a complete protein and contain a balance of proteins, essential fats, vitamins and enzymes. I eat hemp seeds every day. I add them to salad, smoothies, oatmeal and homemade energy bars and other recipes. Hemp seeds are a fantastic food for vegans and vegetarians thanks to their high content of omega-3 essential fatty acids. 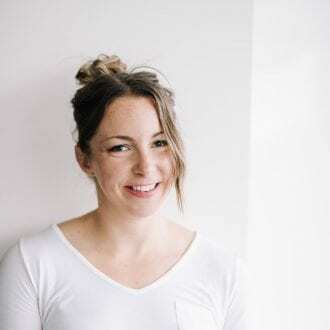 They’re also an awesome source of protein, including all 20 known amino acids plus fibre and vitamin E. They have a slightly nutty flavour, chewy texture and a list of health benefits too long to talk about in this post. Parsley: Not Just A Garnish! Guys, did you know that parsley is one of the healthiest foods out there and contains plenty of antioxidants and important vitamins? It’s a good source of vitamin C and vitamin A, both powerful antioxidants than can help reduce the risk of a wide range of disease. Parsley is also a good source of folic acid, important in cardiovascular health and cancer prevention. Fresh parsley is a weekly staple in my kitchen. 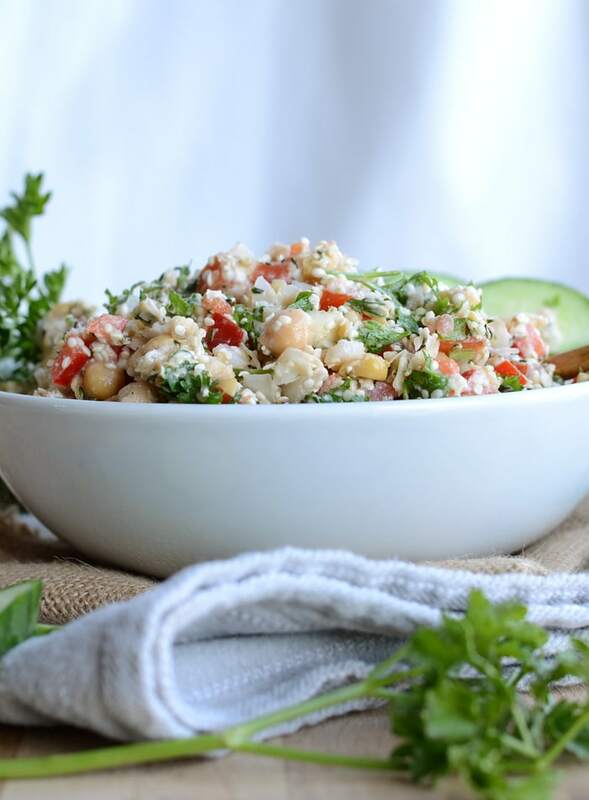 My favourite ways to use parsley are in this tabouleh salad and in chimmichurri sauce. I use it in a lot of homemade salad dressings too. Simply blend a handful of parsley with other green herbs, some garlic, fresh lemon juice, apple cider vinegar and a dash of pure maple syrup. This wonderfully light and fresh chickpea salad is a take on traditional couscous tabouleh. Serve as a light side salad, main dish or in a pita or wrap. I have a bunch of hemp seeds to use up! This looks like the perfect recipe to use them in. This is a great idea. I love chick peas. I did a little slap-dash to it (to my taste) but all-in-all a wonderful idea! Thank You! I followed this recipe but added about a cup of cooked couscous and about 3 cups of cooked kale (to hearty it up and spread it further) in order to eat it for lunch all week. I packed it in a container with half of a baked sweet potato and it made 8 great lunches for my partner and I. Wonderful!! I’m so glad you enjoyed it. Sounds great with the added couscous and kale! What would you reccomend as a substitute for hemp seeds? Ground flax perhaps?? Thanks! I wouldn’t recommend ground flax in this recipe. You could use couscous or quinoa and make a more traditional tabouleh, or maybe do a mix of chopped sunflower seeds and a grain.